Sw Keshavananda (with glasses) standing immediately behind Sri Ma. 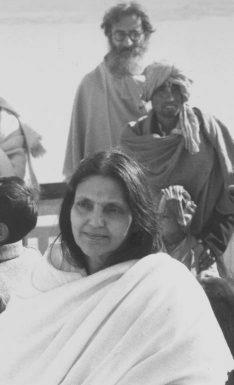 By Shree Shree Ma Anandamayee Archive. Swami Keshavanandaji was born in a Parsi family of Mumbai (Bombay) and followed the Zoroastrian religion till his meeting with MĀ after which he embraced the Hindu Sanatan Dharma. His first name was perhaps Kavas (a Parsi Name) but he was known in the Ashram as Kharas. He qualified as an Electrical Engineer and joined the Tata Iron and Steel Company at their works in Jamshedpur town (named after the Parsi founder – philanthropist and a pioneering industrialist, Sir Jamshedji N Tata). He first met Mā around 1936 or so in Jamshedpur when Mā was staying in a Kali Temple located outside the city on a hill. Every evening after office hours he would visit Mā along with other Bengali devotees and would sit late in a bemused enchanted mood. By 1937 he had decided to embrace Hinduism and sought diksha. Ma instructed Bholanathji to give him Diksha. In 1937 he visited Kheora village (the place where Mā had revealed Herself) with Mā, Bhaiji (Jyotish Chandra Ray) and others. One morning sitting on the raised small divide of the open field outside Mā’s cottage with Bhaiji, suddenly Mā came out of Her room and approached them. Touching Kharas on the head She named him ‘Keshav’. For the next 10 years he led a detached life in sadhana as per guidance of Mā and in 1947 he decided to join Mā’s ashram fully as an inmate. He witnessed the Savitri Maha Yagna in Varanasi which continued for 3 long years and ended on 15th. January, 1950. In the same year on the bank of Ganga below Mā’s ashram in Varanasi, he was initiated into Sanyas on ‘Akshay Tritiya’, 20th. April by Didima (Muktananda Giri) and given the name Swami Keshavananda Giri. He would not carry any money or even touch money on this journey. He would stay in Choti (hill hamlets), Dharamsalas, Sadhu Kutias, temples away from human habitation. He could not stay at any place for more than 3 days. He could not beg for alms and accept food only if offered to him. He could only carry 2 sets of clothes and 2 blankets and his Kamandalu for water and Khapra for food. He has to carry everything himself and seek no assistance in their carriage. He successfully completed the above task not once but twice. He had many experiences during these trips but being quiet and reticent by nature he never spoke about them unless Mā questioned him in public to make ordinary people aware of what is possible if one has the faith and perseverance to follow the Guru’s directions. Given hereunder are 3 small incidents which have been related before Mā to all devotees. Darshan of Mā Ganga and Mā Jamuna in human form. He twice went round the Ganga river from Gangotri to Ganga Sagar (Bay of Bengal) by travelling on the left bank and returning on the right bank. An important incident took place in one of his trips. He was coming down the Himalayas and for 3 days had travelled without food. He was exhausted and hungry and sat on a roadside stone to recoup some energy. In his acute hunger he had a feeling if he could get some ‘Puranpuris’ – a famous Gujarati morning breakfast item. No sooner this thought occurred to him he was approach by 2 young ‘pahari’ (hill) girls 16 years old, saying today is Amabasya (the first day of the moon) would you accept some food to break your fast? He nodded and then within the folds of their sarees they took out Puran Puris (stuffed parathas) and offered him in his ‘khaper’. He was so hungry without waiting he started eating. No sooner he placed the hot puranpuri in his mouth, he wonder how in this cold weather such a hot item was served. He got up and chased down the mountain path in the direction they had gone for about 2 miles without any trace, as if they had disappeared. However, he eat the purupuris with relish. His hunger was fully met and energy recouped. Mā asked him if he could remember anything more about the women to which he replied that all that he could remember was that one woman was fair and the other was dark. Mā then exclaimed that he had been blessed with the darshan of Mā Ganga and Mā Jamuna. Once he was caught in a blizzard and he could not make out the road or surrounding area and there was every chance of his slipping down a crevice and losing his life. He did not know what to do when the thought came to him that he should call out to his GURU and ISHTA and ask for help. He did that and he was told to follow a light, which he did, and after some time he came to a camp of the Border Security Force who gave him shelter and his life was saved. Once he was travelling through West Bengal and had sought refuge in an abandoned Shiva Temple on the outskirts of a village and had gone to sleep. Early in the morning an old widow came to the mandir and started to sweep the courtyard and the temple. Seeing her he got up and sat erect on his bedding. At that very moment a “Bel Leaf” fell on his head from the tree above – seeing which the old widow prostrated herself before him and called him BHOLANATH — a name of Shiva. She ran off immediately to the village and before long a good crowd had collected in front asking him for his blessings. He had quite a time to convince them that he was not Shiva and that he was a sadhu doing the Ganga Parikrama. Further, Mā had revealed that travelling in such arduous terrain with just 2 woollen blankets in this holy traveller’s trek is indeed a sign of a true sadhu. He had also travelled a few times to Kedarnath and Badrinath temples in the Himalayas – the temple of Shiva and Vishnu. He travelled extensively all over India with Ma or on Her instructions. He led an exemplary sadhu life – austerity, simplicity, eating his meal in ‘Khaper’ (dried special coconut shell in half), sadhana and daily reading the entire Gita by getting up early morning around 3 am. The Gita which became his life-long possession was a small 3 inches square booklet. He carried no money with him and travelled as per Ma’s order on foot unless someone purchased bus or train ticket or offered a seat in their car. He kept only 2 sets of cloths – ‘alkhala’ – long loose kurta (shirt), loin cloth and short dhoti. Every day while taking bath, he would wash the set he was wearing, dry them in the sun and use them as pillow at night. He slept on the ground, mat or wooden takat (cot) as was available. He carried only 2 blankets and used them as bed or in winter as cover. He was tall and thin with robust health. He had an enormous appetite. On occasion of a Sadhu Bhandara (feast) he could devour after a hearty meal over 5 kg. of ‘pyas’ (sweeten thick milk boiled with rice) a delicious sweet item, served at the end of the feast. Otherwise, he maintained a habit of whatever was given to him once, with no second helping. His main stay had been in the ashrams of Almora, Dehradun and Varanasi. He was a person of selflessness, serene and sober, sought no importance, could sit in meditation for hours. His nature generated respect to onlookers. After the construction of sadhu kutiya (a block of rooms for the stay of sadhus) in Kankhal ashram, Haridwar, he lived there for over 20 years. In his last days he was not keeping good health. He left his body at the age of 91 on 1st. September, 1998 at Kankhal on the bank of Ganga to be in the heavenly abode in the presence of Divine Mother. (3) to feed the Gou (cows) everyday. In his last days as he was a victim of dementia and could not even remember the Brahmachari ( Sunilda) who had been serving and attending him for almost 24X7 but when asked about his association and anecdotes with Ma and Didima (Sw. Muktananda Giri, Ma’s mother and his Sanyas Guru) he could describe with intricate details and date. It remains a puzzle to me that he did not forget his Snowmen even during dementia ( he started calling me by this name since I left Kankhal and had been staying in Dhaulchhina from 1987 onward) He was ever jovial and witty during his interactions with others. During my association with him for two decades I could not remember him ever being in a pensive mood or angry. Ma’s kheyal was that everyday there should be Satsang from 4.00pm to 5.00pm in the Sankaracharya hall at Kankhal and a paid Pandit had been engaged for that. The ashramites were expected to attend the satsang. It was only Swami K who never missed a single day during his long stay at Kankhal before being indisposed in his last days. Sw. K had always been shying away from extra-spiritual and administrative activities of the organisation and nobody had ever seen him indulging in idle gossip.